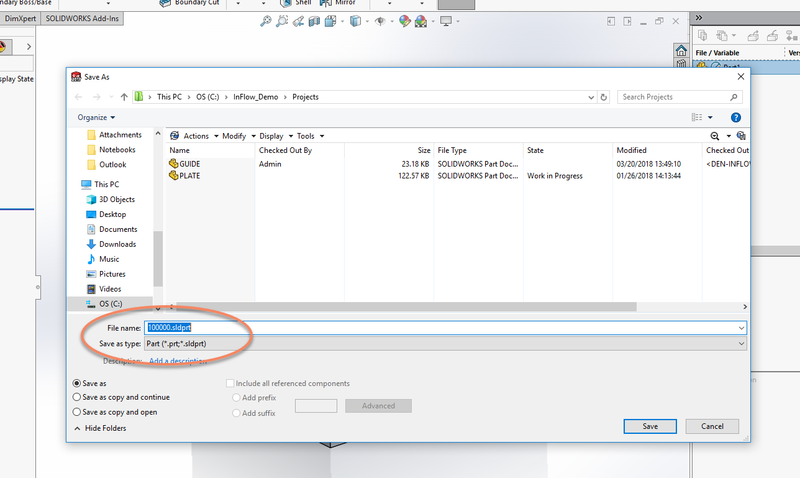 In this post, we are going to look at automatic part numbering in SOLIDWORKS PDM Professional. The setup takes a few minutes, but the benefits are long-lasting. 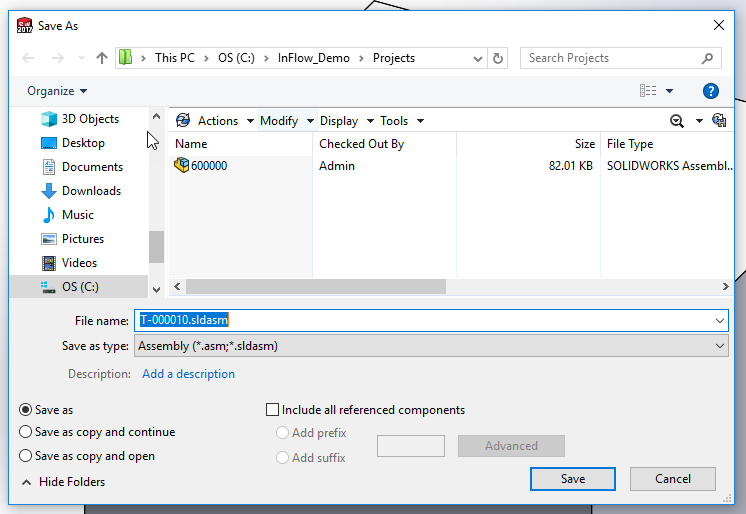 For this setup, we will be creating a sequential serial number to drive our SolidWorks components (1XXXXX), a numbering system to auto number SOLIDWORKS assemblies (6XXXXX), and a list of numbers for tooling creation (T-XXXX using a pre-defined list). In this example, our engineers will utilize the numbering for SOLIDWORKS parts and assemblies. However, the tooling numbers will be setup primarily for a tooling designer. Let’s go through the setup. The first thing we will do is create serial numbers that will drive each of the auto-numbering setups. We will start with the numbers required for SOLIDWORKS components (.SLDPRT). Log into the PDM Professional Administration tool as Admin. 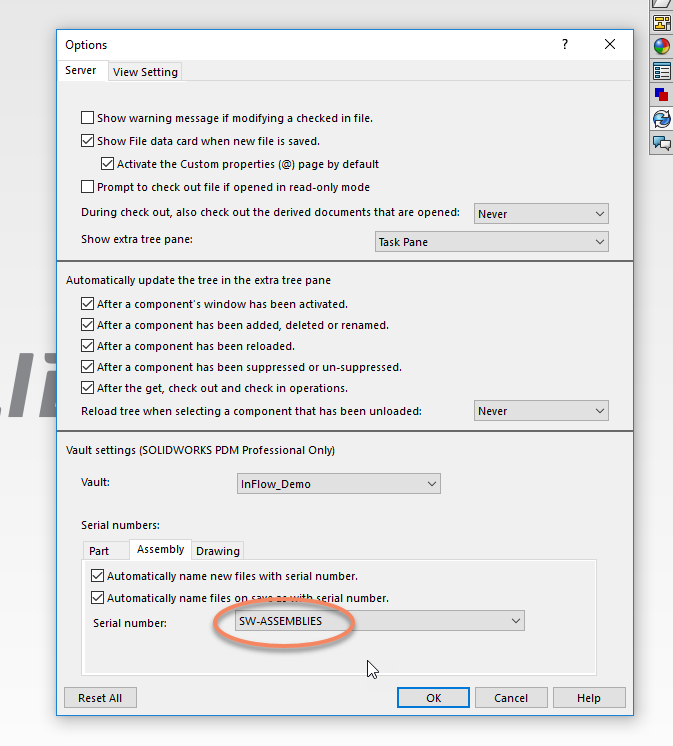 Next, within the Admin tool, right click the “Serial Numbers” module and select “New Serial Number”. After that, the “New Serial Number” dialogue box will appear. Since we are setting up multiple serial numbers, we want to name this something that is easily identifiable. 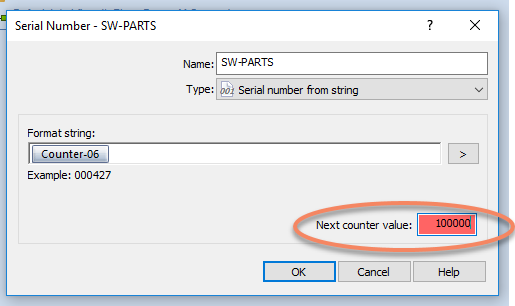 I’m starting with the SOLIDWORKS part numbers, so I’ll name this serial number SW-PARTS. For “Type”, we will leave this one “Serial number from string”. In the format string, we will click the > arrow and select “Counter Value > 000001”. Since our components need to follow the 1XXXXX format, we will adjust our “Next counter value” to 100000. 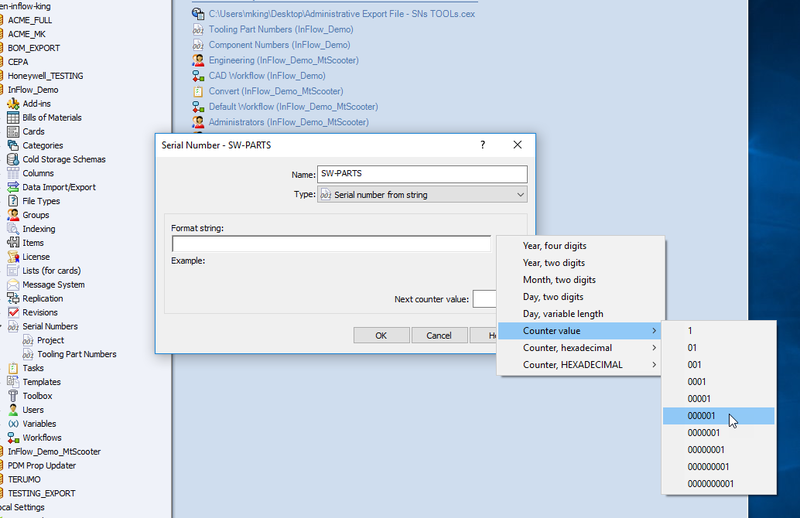 Within the format string, we have the option to build intelligent part numbering schemes that can be driven by a combination of static text and a running automated value. For this example, we will simply use the counter. Next, select “OK”. 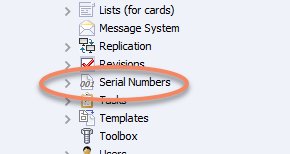 The new serial number should now be listed under “Serial Numbers” in the admin tool. 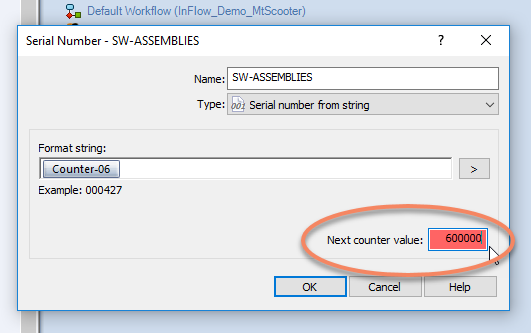 We will do the same steps for creating the SW-ASSEMBLIES serial number generator, except this time, we will set the “Next counter value = 600000” and select “OK”. 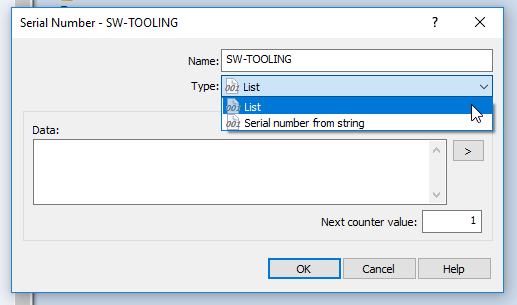 In the “New Serial Number” dialogue box, name this serial number SW-TOOLING. This time, we will select “List” from the Type drop-down list. In the Data field, we will add our predetermined tooling numbers. These can be typed in manually or copied and pasted from excel. For this example, I’m copying the information from an Excel sheet. After you have added the list of numbers, click “OK”. Now that we have our 3 serial numbers created in PDM, we will configure SOLIDWORKS to utilize these serial numbers for auto-numbering. 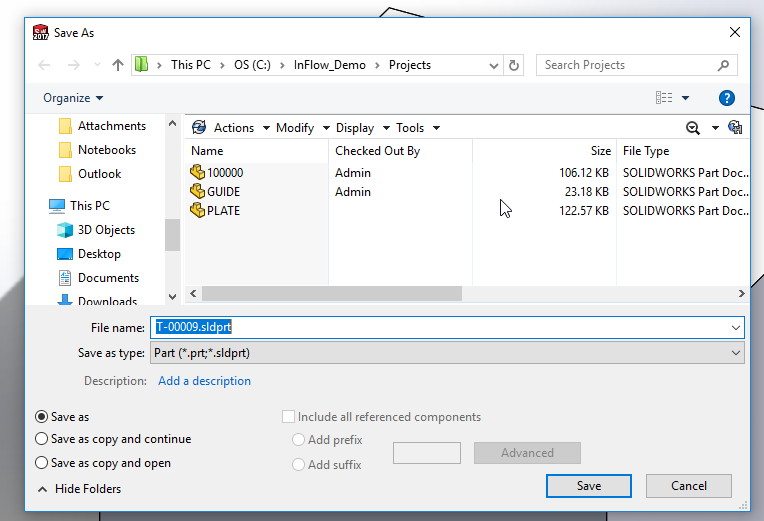 Before we configure SOLIDWORKS, we need to be logged into our vault with admin privileges. After logging into the correct vault, it is time to jump into SOLIDWORKS. The options screen will appear. Make sure you are looking at the Server tab. Towards the bottom 1/3 of the page, there is a section labeled “Vault settings (SOLIODWORKS PDM Professional Only). This is where we will link to the PDM serial numbers. The first thing we need to do is make sure the correct vault is selected from the “Vault:” pulldown. Next, under the “Serial Numbers:” section, select the Part tab. 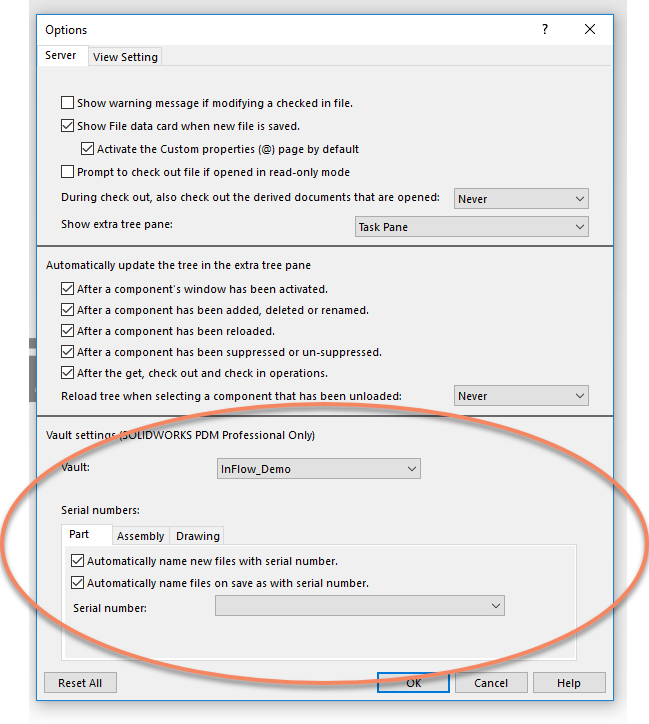 Check the options you would like to enable, then select the appropriate serial number from the drop-down list. In this example, I have selected “SW-PARTS” from the drop-down. Next, click on the Assemblies tab, and select the appropriate serial number. In this example, I have selected “SW-ASSEMBLIES” from the dropdown. 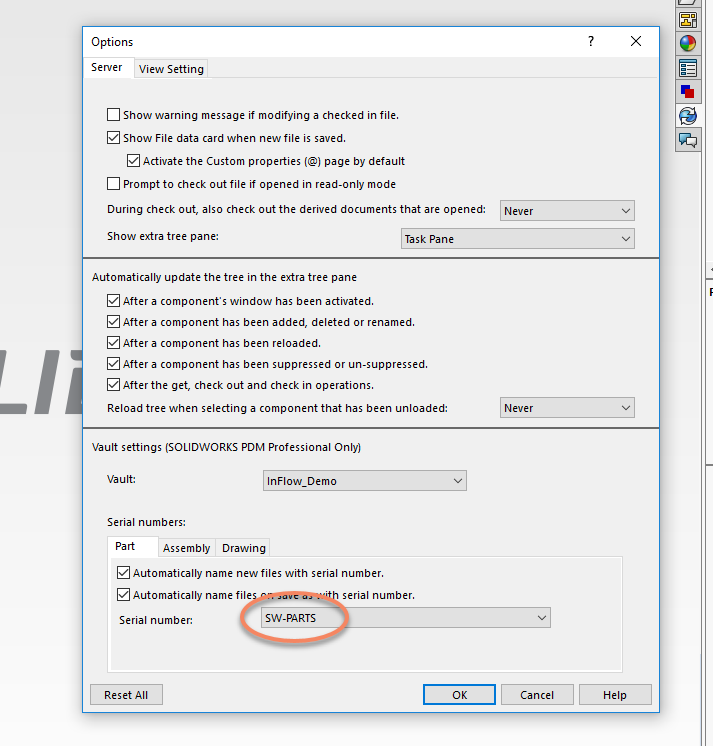 Now, after we select “Save As” into our vault, the serial number will be automatically applied to our filename. In this image, the .SLDPRT was automatically named to 100000.SLDPRT. In this image, the .SLDASM was automatically named to 600000.SLDASM. Finally, the last auto number we need to address is the Tooling. In this example, we are giving the tooling designer a set of numbers to create tooling components. On the tooling designer’s system, we will drive to the same SOLIDWORKS PDM, options menu and configure. On the designer’s system, we will link the serial number for SW-TOOLING to both SOLIDWORKS parts and assemblies. This will utilize the same serial number, using the predefined list, for either a part or an assembly. Controlling part numbers by using PDM serial numbers may not work for every situation. 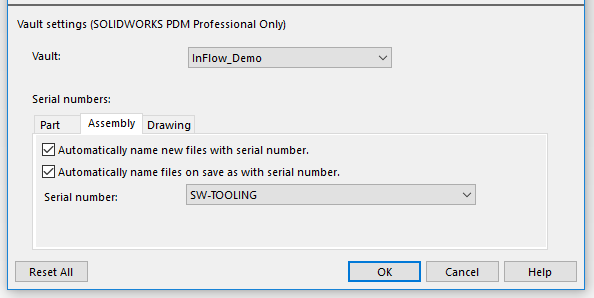 However, auto-numbering with PDM Professional has the ability to alleviate the burden of manually obtaining part numbers for SolidWorks files. 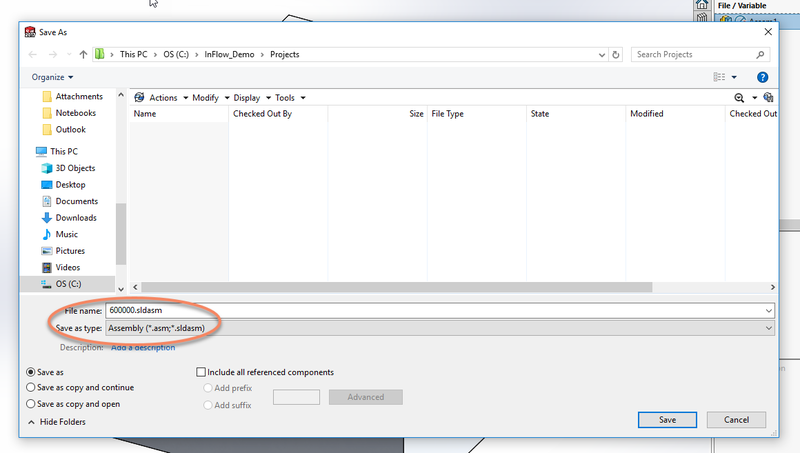 Parallel Approval Data Mapping Is Finally Here In EPDM 2015! How to determine which client type is installed on a EPDM machine?